AC Motors are used widely in Industries for delivering mechanical power. But there should be proper maintenance of AC Motor for increasing its life and efficiency. Due to dust, wear and tear as time passes the efficiency of Motor tends to decrease, leading to many problems. In this article, we will see how to reduce the sound (noise) of AC Motor. There are many issues related to Motor problems. But we should remember one key point, i.e. the most important factor to reduce motor problems is schedule inspections and regular service. 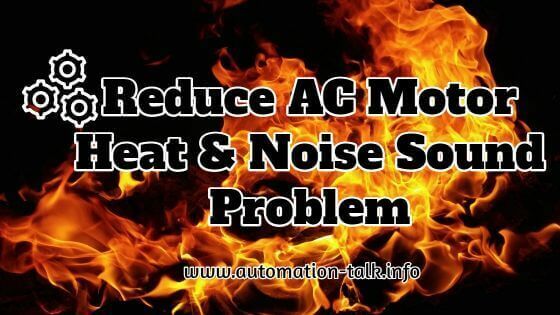 We will discuss more about Motor heat and noise problem in this post. First and foremost, feel the motor nameplate and bearings for "heat and noise". If the Motor connections are loose then it could be also the reason for the motor noise. There are 3 main reasons for Motor Heat generation. 1) Low Rating Motor:- It may be possible that Motor Selection is wrong or the starting torque required for the load is large than delivered by the motor. 2)Overloaded machine :- If the machined is driven overloaded then also heat generation will take place. The overloaded machine draws more current and thus more heat. 3) No Cooling Arrangement:- If the motor is installed in a dirty location or dusty environment, then the motor will have no cool air to flow around it and it will take hot air from surroundings and thus leading to more excessive heating. The main problem which arises due to overheating is on the Insulation of Motor Windings. Heating beyond the insulation rating deteriorates Motor winding life. Noise in Motors, however, does not cause any damage but still, we should take proper measures to reduce it. Noise is directly associated with Vibration. Loose bearings, poor lubrication, excessive friction are a few causes of motor noise problems. If there is misalignment in motor shaft then also motor will make the sound. However, the sound problem in a motor can be due to Mechanical imbalance or Electrical imbalance. To check out whether the Sound generated by Motor is due to the Mechanical or electrical issue, first disconnect the Motor shaft from Load and check out the Motor Operation. If the Motor Sound stops then look out for mechanical imbalance at load side. If even after removing the load sound is coming then Check for electrical Imbalance in motor supply, then make sure to tighten the Motor wires correctly. Sound from electrical imbalance is due to un-even magnetic attraction between stator and rotor. We will be discussing more about other major AC Motor problems and maintenance of AC Motor in our further posts. Till then you can subscribe to get all latest updates in your Inbox. Subscribe to Automation-Talk by Email.